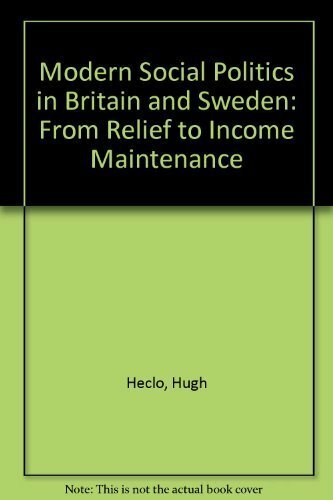 This book is an important and significant contribution to our understanding of the politics of income maintenance policies on a cross-national basis, and it provides a fascinating study of the impact of political culture on the policymaking process.A valuable contribution to all students of European politics and to students of comparative public policy. Hugh Heclo is Robinson Professor of Public Affairs at George Mason University, a former Professor of Government at Harvard University, and prior to that a Senior Fellow at the Brookings Institution in Washington. Most recently he is author of Christianity and American Democracy (Harvard University Press, 2007) and On Thinking Institutionally (Paradigm Press, 2008). He currently serves on the 12-member Scholars' Council advising the Librarian of Congress and in 2002 was honored by the American Political Science Association with the John Gaus Award for lifetime achievement in the fields of political science and public administration. For the past 25 years, he, his wife and daughter have operated a Christmas tree farm in the northern Shenandoah Valley.